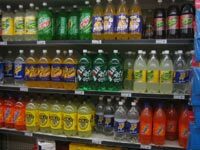 Fizzy drinks like Perrier and Coca-Cola are targeted at a huge range of social groups, but if fruit flies had any capital to spend, they’d be at the top of the list. Unlike posh diners or hyperactive kids, flies have taste sensors that are specially tuned to the flavour of carbonated water. Humans can pick up five basic tastes – sweet, salty, sour, bitter and umami (savoury). But other animals, with very different diets, can probably expand on this set. And what better place to start looking for these unusual senses than the fruit fly Drosophila, a firm favourite of geneticists worldwide, and an animal with very different taste in food to our own. Drosophila‘s tongue contains structures that are the equivalent of our own taste buds. They are loaded with taste-sensitive neurons and the activity of specific genes gives these neurons the ability to recognise different tastes. 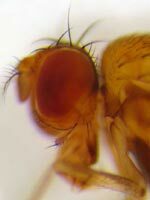 Other researchers have already isolated the genes that allow Drosophila to tell sweet from bitter. But when Walter Fischler found a group of taste cells that didn’t have either of these genes and connected to a different part of the fly’s brain, he knew he was on to something new. Together with colleagues from the University of California, Berkeley, he began to expose the new cells to a wide variety of chemicals to work out what they responded to. Nothing worked – the cells blithely ignored sweet and bitter substances and they turned a blind receptor to sour compounds, salts and amino acids. The only thing that seemed to turn them on was beer – well, that and the brewer’s yeast Saccharomyces cerevisiae used to make the beer. Before concluding that flies are closely related to university students, Fischler ran a few more tests. He noted that flat beer had no effect on the new taste sensors, nor did dry yeast. The yeast were secreting something into the surrounding liquid that tickled the sensors – carbon dioxide. Once Fischler figured out the sensors’ secrets, he found plenty of evidence to support his idea. The new neurons responded to fizzy water, but not after it had gone flat. Dry ice, the frozen form of carbon dioxide, worked too. The new taste cells are specifically designed to detect carbon dioxide in solution and picked up far lower doses of the dissolved gas than the airborne version. They allow the fly to pick up the traces of CO2 in the liquids they drink, and Fischler found that they have a ‘fizzy tooth’. He gave them a choice between two solutions of sodium carbonate, an alkaline one with low levels of dissolved CO2 and a neutral one with higher CO2 levels. As predicted, they strongly preferred the neutral one. But the flies had a sweet preference too that was much stronger than their fizzy inclinations. Fischler believes that this is because sweet tastes are a direct measure of a food’s nutritional value. CO2­ itself isn’t nutritious, but it does give away the presence of other things that are – yeast, bacteria and other microbes that produce the gas as a by-product. Fruit flies can’t just taste CO2 – they can smell it too. They have specialised smell receptors that pick up the gas and unlike the taste receptors, they steer the fly away from CO2 sources. Because one pathway senses carbon dioxide in the air and the other spots it in liquids, the two pathways don’t interfere with each other. Nonetheless, it neatly shows how a single molecule can trigger two different senses, and trigger opposite behaviours depending on which it does. Fischler believes that this is probably the first time anyone’s discovered a taste sensation in animals that humans don’t possess. It could be that the ability to taste carbon dioxide is unique to Drosophila and its kin. Alternatively, similar taste cells could exist in other animals, waiting to be discovered. Certainly, Fischler believes that we will discover that other animals have many new types of taste cells, fine-tuned to the relevant chemicals in their environment. Humans may even end up with more than the purported five.